We offer the perfect start to your day with a diverse array of fresh and healthy products from our breakfast bar! We pride ourselves on offering one of the best breakfast buffets in the city – come and see for yourself! … a rich breakfast buffet including many organic products awaits our guests. Freshly brewed coffee is personally served by our staff. Tea lovers will be delighted by our fine selection of Sonnentor teas. Help yourself to our specialty breads, warm and cold savory food, a variety of eggs, healthy cereals with a selection of different yoghurts, and seasonal fruits and pastries. Get a pure vitamin kick with freshly pressed juices! We offer various sorts of fruits and vegetables according to season. On Sundays our guests can indulge themselves with a Prosecco breakfast. As a certified environmental enterprise, it is important to us that we offer regional products to our guests. We are supplied by partners from the surrounding area, and also many home-made items, such as jams, cakes, and waffle batter are offered in our buffet. You are also welcome to spend your breakfast with us here in Linz if you have not stayed the night. Please call to reserve your table in advance: 0732-66 16 90. Breakfast is often included in the room rate for hotel guests. If you have booked your overnight stay without breakfast, you should not miss out on this great opportunity! 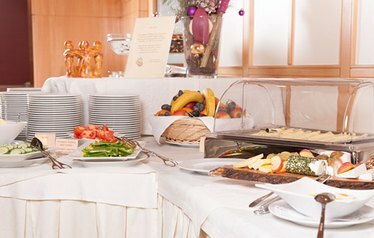 The breakfast buffet including unlimited hot beverages (coffee, tea, hot chocolate) is offered at € 15 (children up to 5 years of age are free, children ages 6 to 12, € 8). Highest customer satisfaction is our goal! Let yourself be convinced by our guests’ reviews on independent travel sites. "The Landestheater Linz has been working together with Hotel Kolping for years now. The performers staying in this hotel rave about the excellent service and welcoming atmosphere which help them to relax in between the stressful rehearsals in the theater." "What always convinces us again and again when booking hotel- and seminar rooms, is the reliable processing, the good and personal support, the pleasant atmosphere, the central but still quiet location, and last but not least, the good value in terms of price and quality." We can be reached 24 hours a day.